2012 Last Posting Dates for Christmas – order your miniature needlepoint gifts in time! Depending where in the world you need parcels sent to, there’s still a couple of weeks left to order your miniature needlepoint gifts from my website, and have them delivered in time for Christmas. The dates listed below take into consideration the fact that it can take a couple of days for your parcel to be made up and posted (so, these dates listed here are two days ‘earlier’ for each category than those shown on the Royal Mail website). There are many kits and charts on my website suitable for all levels of stitcher – from beginner to advanced. You can either give the items as a kit / chart for the recipient to make up themselves, or, if they don’t ‘do’ stitching, maybe make it up yourself and give it as a finished item. Items such as doll’s house scale cushions, samplers and footstools can be stitched in a couple of evenings, for instance. 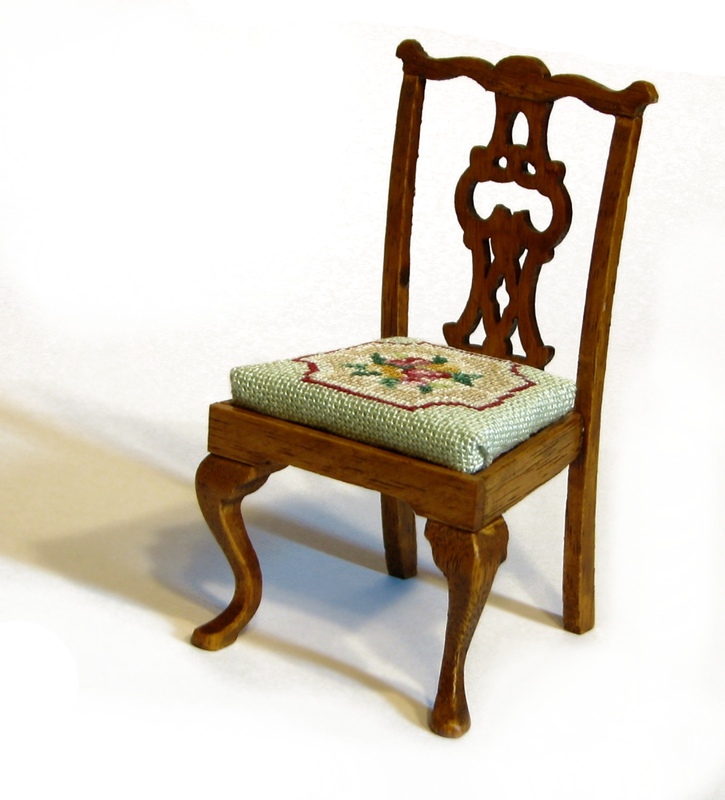 Have a look in the Online Shop now, to choose from over 170 designs – there are kits for all kinds of doll’s house embroidery – from bellpulls to carpets, Christmas stockings to dining chairs, all in one twelfth scale (one inch to one foot). Remember that, for items ordered via the website, p&p is free, worldwide, on orders of 10 GBP or over (under 10 GBP, there is a flat rate charge of 1.25 GBP per order). Author Janet GrangerPosted on November 25, 2011 March 5, 2012 Categories Christmas, Christmas tree matsTags Christmas, Crafts, Doll's house, Doll's house furniture, Dollhouse, Embroidery, Hand embroidery, Last Posting Date, Last posting datesLeave a comment on 2012 Last Posting Dates for Christmas – order your miniature needlepoint gifts in time! 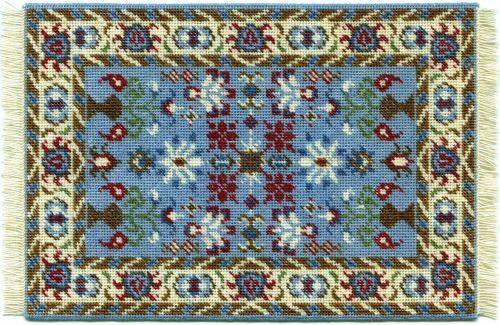 I’ve just launched a new miniature needlepoint carpet kit on my website today- it’s called ‘Saskia’, and it would make a great Christmas present! Full details are on the ‘Large carpets’ page of the online shop, here. The design is an Oriental one, in shades of mid-blue with deep red and cream highlights, and measures 9 x 6 1/4 inches. It would look great in a study or drawing room in your doll’s house. The kit contains 18 count canvas, plenty of Appleton’s crewel wool, detailed instructions, a colour-block chart to count the design from, and a suitable needle. The design is worked in needlepoint – tent stitch for the details and basketweave for the background. Both stitches are easy to do (very similar to half cross stitch). There are Tutorials on my website, showing how to do these stitches, if you are new to embroidery. If you prefer to choose your own colours, or work the design on a different count of fabric, then a chart pack is also available. The full kit costs 21.50 GBP, and the chart pack is 10.75 GBP. If you’re after smaller ‘stocking filler’ type gifts, then have a look at the What’s New page for some ideas – twenty new kits have been launched in recent weeks, so it’s likely that there will be something suitable. Remember that, for items ordered via the website, p&p is free, worldwide, on orders of 10 GBP or over (under 10 GBP, there is a flat rate charge of 1.25 GBP per order), and parcels are usually posted within two business days.